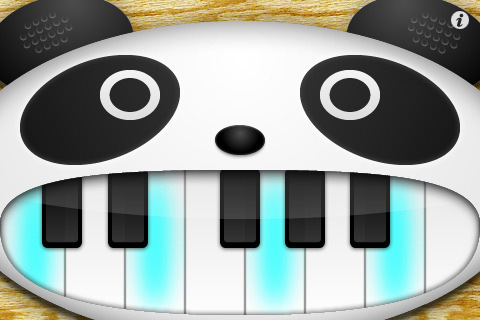 ToyPiano (Panda) is an instrumental app that’s, you guessed it, a piano and a panda. It’s funny, when all of the instrumental apps first came out; I was so excited to try them all. Now when I play a new piano app, I look for the differences that set it apart from the hundreds of other apps out there. This one isn’t bad, the panda caught my attention. The keyboard is the panda’s mouth, the left eye is the drum, the right eye is the tambourine, and the nose is the cymbal. The keyboard has white keys, along with flats, that illuminates neon blue when played. There are 13 piano keys, making an octave. You can play as many keys and instruments as you want, if your fingers fit on the screen. That’s pretty much it. This app is simple, but for a great price of $0.00, I’d download it. Since there are so many instrumental apps out there, the developer, Takeshi Muramoto needed to dig deep to set ToyPiano apart from the pack. The fact that they keyboard is in a panda’s mouth is cute, and the cymbals and drums are a bonus. Everything in this iPhone app executes well, I couldn’t find anything wrong with its functions. However, to set itself farther apart from the competition, the developers should add a bit more to the app. It would be fun if we could record a song and have the option of emailing it, or posting it to twitter or Facebook. I don’t really mind which animal I’m playing as an instrument, but maybe little kids would, so having the choice of different animals to play would be fun. This app may be free and thus appealing, but it looses credibility when the description at the iTunes store reads: “a toy piano that had panda’s face.” Given the fact that we are able to play multiple keys and instruments at the same time, I’m surprised the developer, Takeshi Muramoto didn’t include the option of running your finger down the keyboard. You can run your finger down the board, but you’ll only hear the note of the initial key played. This is a fun app if you are in need of a piano app. It’s simple, functions well, and looks cool. AppSafari review of ToyPiano (Panda) was written by Amanda McFarland on May 21st, 2010 and categorized under App Store, Music. Page viewed 4576 times, 1 so far today. Need help on using these apps? Please read the Help Page.